As winter draws near it’s important to evaluate your wardrobe and stock up on winter essentials if you want to look great throughout the season without sacrificing comfort. Follow these tips to find the right pieces for your wardrobe that will keep you warm and stylish all winter! If you know that you’ll be wearing a coat every day for several weeks or months, shop for coats that work well in every situation, from meetings at the office to running errands on the weekend. A classic peacoat in a neutral tone will always be a safe choice, but if you’re a little more adventurous, try something like a military style jacket in a bright color. Winter weather is often accompanied by snow and ice. To keep your feet warm and dry while still looking great, order a variety of boots and booties. Booties are elegant and fun in any situation, so you can wear them to the office on a daily basis. When you’re ready to ditch the high heels and wear something more comfortable, booties are also available in a low heel. When it comes to the winter months, it’s wise to think about the function of the items in your wardrobe. Luckily, boots and booties look fabulous in addition to being practical. Winter winds are miserable to face without a warm scarf. When you know that you’ll be out and about this winter, make it a priority to stock up on several scarves. Infinity scarves are popular this season, and you’ll be able to find one in any color or pattern that suits your taste. If you’re a bit more traditional, conventional knitted scarves can lend a cozy vibe to all your winter wardrobe pieces. No matter what kind of scarf you choose, there are a variety of ways to wear a scarf so you can switch it up each day for a fresh look. When the chill of winter is upon us, a hat is an important accessory. Wearing a hat helps to preserve your body heat and keep your ears warm, but a hat is an often-overlooked way to make a fashion statement. Hats are available in all colors, materials, and designs, so you’re sure to be able to find a few that you love. Hats are one of the most versatile accessories and they always come in handy on days when the cold seems unbearable. If you’re hoping to use your hat to stay warm and cozy, look for materials like faux fur or cashmere. Chances are, you probably have a closet full of sweaters from previous winters. If you’re hoping to splurge on other big-ticket winter items like a coat or boots, you can skip stocking up on new sweaters by giving your current selection some attention. Sweaters are known for pealing, and this makes the fabric look like it’s ready to be retired. However, this isn’t the case: you can get rid of pealing by investing in a fabric shaver or simply by gently taking a razor to the material. Be sure to go slowly and be as gentle as possible to prevent ripping the fabric. After a little attention, your sweaters from last season will look as good as new. Gloves are essential when you live in an area that has brutal winters. Just like a hat, gloves help to keep your body heat where it belongs and they also lend a sense of elegance to any outfit. Black leather gloves are a classic choice, and it’s hard to beat leather when it comes to warmth and versatility. However, warm knitted gloves are also great for those who love to wear handmade items that look and feel extra cozy. If you find it difficult to stay warm in fabrics like cotton and wool, leather might become your best friend. Although leather is one of the more expensive materials to invest in, it’s often well worth the cost. Heavy-duty leather goods like coats, gloves, and boots ensure that you’ll stay warm no matter what. This material has the advantage of getting better with use, so you’ll be wearing your leather items for years to come. 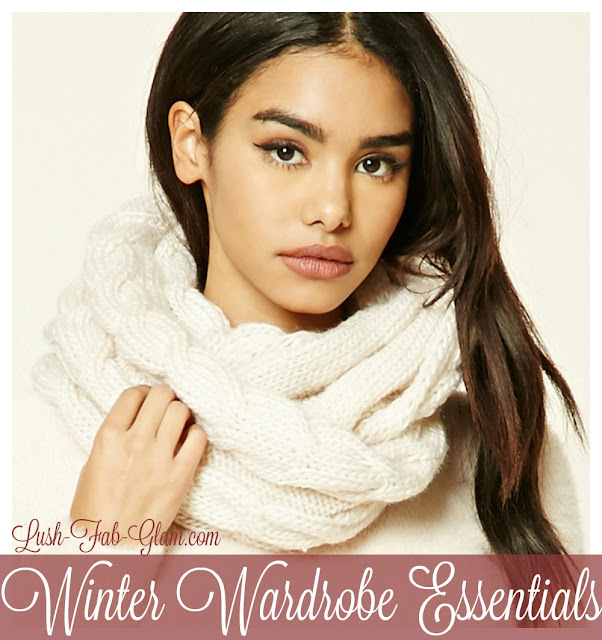 What are your favorite winter wardrobe pieces and which featured winter wardrobe essentials do you love? Share with us by leaving a comment below. I love a good pair of gloves! I used to have a pair with faux leopard print cuffs. They kept my wrists so warm. I couldn't agree more! One thing I regret when I lived in Canada was not allowing myself to be fashionable during winter. Now that I live in LA, I have no excuse and these are certainly helpful in helping me do so! I love all these pieces! If only I could wear them in Florida! yep time to get some cute and cozy boots! I love all of these! I own a peacoat and I love it. Very cute! especially the hats! Will have to remember these for next winter, almost summer here in Australia! They are all lovely though. I love those scarves! They look so cozy and warm. everything is so cute but I really love the coats! Nice accessories. Smaller heels for me please! I really need new winter clothes after losing some weight. Thanks for the great ideas! se manfique winter wear. they look amazing, my mom and sister would love them. The scarves should definitely be my favorite -- so classy and chic! I love a good scarf. They're my favorite. Great list of essentials!!!! I'm all about nice coats this time of year! Love your selection, especially the off the shoulder gray coat. I love 'em! We don't have winter here but I do have this thing for winter fashion. They all make you look like you're on a feature of a fashion mag. Peabody coats are always my favorite - they're so versatile yet stylish. Those are all must haves, indeed! I really like the coat and the scarves. You can never go wrong with sweaters as well! The ankle boots/booties are a big plus for me! I love those! Everything on this list will help your survive the winter... in style!